If you’re looking for great, affordable carpet cleaning in Morrisville, PA, you have come to the right place! Oxigreen is a local company with 25 years of carpet cleaning experience offering great competitive rates for commercial and residential carpet cleaning. Our technicians are certified by the IICRC, the Institute of Inspection, Cleaning and Restoration Certification. We offer same day service to all of our commercial and residential customers, in case you have an emergency. Our cleaning process is fast-drying, allowing you to return to your normal routine in as little as an hour or two! We are proud to employ a carpet cleaning method that provides a deep and long lasting clean. We will lift and restore the carpet fibers in those matted, high traffic areas. We will tackle the soil, allergens, and other pollutants caught deep in the carpet fibers, ones that usually go untouched by most carpet cleaners and vacuums. We use safe, biodegradable cleaning agents the leave behind no toxic residue, creating cleaner air in your home or business. Absolutely no harsh chemicals are used that could damage the fibers of your carpeting. 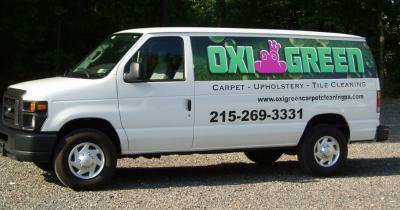 For great, affordable carpet cleaning, call Oxigreen in Morrisville, PA today at 215-269-3331. Our friendly customer service representatives are available to answer any of your questions, offer you a FREE QUOTE, and schedule a free in-home carpet cleaning inspection or cleaning appointment for you. At Oxigreen in Morrisville, PA, we offer a 100% satisfaction guarantee. If for any reason you are not completely satisfied with the job we do, we will come back and do it again. If you are still not satisfied, your carpet cleaning is absolutely free! We have that much confidence in our company and our great service technicians. We know we will do a great, affordable carpet cleaning job for you.